Young people often head down to the Hongik University area, popularly known as Hongdae, for a night of fun, dancing, drinking and partying. No wonder since Hongdae is synonymous with dance clubs and live music bars, especially the exciting ``Club Day'' event that takes place on the last Friday of every month. But there is more to Hongdae than just clubs, bars and parties, as a group of foreigners found out last Sunday with a unique walking tour organized by KT&G's cultural center Sangsangmadang and Seoul Foundation for Art and Culture. Around 20 foreigners, a mix of teachers, artists and students, joined the ``Rediscovering Hongdae'' walking tour. It was the first time the tour was conducted in English for foreigners, although there have already been free tours in Korean on the last Sunday of every month since April. The tour was meant to break the perception that Hongdae is just a place to party, and to reestablish Hongdae's position as a place of art and culture filled with energy and creativity. 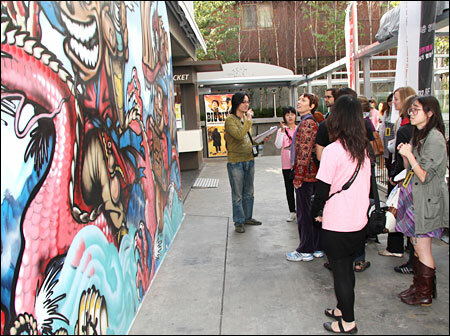 ``We want to introduce the `real' Hongdae,'' tour guide Jung Moon-shik told the participants before the start of the tour. Many often forget Hongdae developed into an ``art town'' because of Hongik University, which is undoubtedly Korea's top fine arts and design school. In the 1980s, Hongdae only had art galleries, studios and bookshops near the entrance of the university. But in the 1990s, dance and music clubs sprouted up. Unlike the flashy clubs in Gangnam and Itaewon, many of the clubs in Hongdae were originally artists' ateliers that were transformed into clubs. The live music clubs also helped nurture the independent music scene, giving a venue for young musicians to perform. Successful Korean rock, punk and hip-hop acts like Nell and No Brain were ``discovered'' while they were performing in the area's clubs. The first stop on the walking tour was the popular Hongdae Children's Park, located near the front gate of the university. It is not much of a playground for children, at least on weekends. The park is transformed into a street market, on Saturdays it is ``Free Market,'' and on Sundays it is ``Hope Market.'' It is open from 1 p.m. to 6 p.m.
University students and young artists set up makeshift stalls around the park, selling their unique arts and crafts. There's a lot of stuff to see and buy, such as handmade earrings, rings and necklaces, stylish clothes, embellished sneakers, dolls, bags, hats, household items and other accessories. This is the perfect place to find cute items to give as presents or handicrafts to decorate your home. ``This place is a famous cultural area. Children gather here to play during the day, while punk rockers come here at night to perform. This park is not just a playground for children, but a symbolic place for young people,'' Jung said. As proof, some buildings around the park have been covered in graffiti as if the artists have staked their claim to the area. Next stop on the walking tour was at the B-boy Theater, which claims to be the world's first. The original show ``Ballerina Who Loved B-boy,'' brings break dancing and urban street dancing on stage. It was supposed to have been a chance to meet with B-boy members and watch their rehearsal. However, it turned out the foreigners could only watch a rehearsal, where the B-boys did not even do much dancing or show off any of their moves. At the studio, Kang showed how with a brush, ink and paper, he can create beautiful calligraphy that conveys the meaning and feeling of the word. Using a brush with chicken feathers or even just ordinary wooden chopsticks, Kang showed how different implements can create various effects in calligraphy. He also used various materials to write on such as Korean traditional paper and even kitchen roll paper. Kang revealed he was always interested in calligraphy ever since he was in sixth grade. ``I really love the beauty of Hangeul,'' he said. When asked if which of his works was his favorite, he cited the calligraphy for the title of a Korean drama, ``King Sejong,'' who created the Korean alphabet. Unlike Insadong and Cheongdamdong, Hongdae is one place where art is not just in the galleries but also on the streets. Even the buildings and walls around Hongdae are decorated with graffiti and bright-colored murals. After all, one person's graffiti can be another person's idea of street art. ``There are around 20 art galleries and alternative spaces in Hongdae. These galleries are not like the mainstream galleries in other parts of Seoul. Unknown young artists are given a chance to show their works,'' Jung said. Since 1993, Hongdae has always hosted its annual street art exhibition during autumn. This year's street art exhibition started Thursday and runs through the weekend. It will be exciting to see fresh and innovative art works by young artists, many from Hongik University, at the exhibition. Seogyodong Street No. 365 is a legendary street in Hongdae, which was once filled with art studios and workrooms. Now, the street is home to many small boutiques selling clothing, shoes and accessories, as well as old-fashioned Korean restaurants. ``This street is very symbolic for the artists in Hongdae. The old buildings used to be workshops of many artists, but now many of these have been converted,'' Jung said. Jung pointed out two famous bars, Chez Robert and Bar Da that still remain popular among artists and music lovers. Jung, who is also the lead singer for an indie rock band The MU:N, recommended going to the bars for ``excellent'' live music and drinks. The final stop on the tour was Sangsangmadang, a cultural center that has a cinema, live hall, art gallery, academy, studio and cafe. Here, indie artists can hold exhibitions at the gallery, while amateur musicians can perform at the live hall. The Rediscovering Hongdae tour lasted three-and-a-half hours, barely scratching the surface of Hongdae's artistic side. But it may have been enough to change some people's perception of Hongdae. Carol Scott, a 25-year-old American teacher, has always gone to Hongdae for the nightlife. She was pleasantly surprised to have discovered something new about the area. ``Sometimes, its hard for foreigners to find out things about Hongdae if you don't speak a lot of Korean. It's great to rediscover this other side of Hongdae,'' she said.